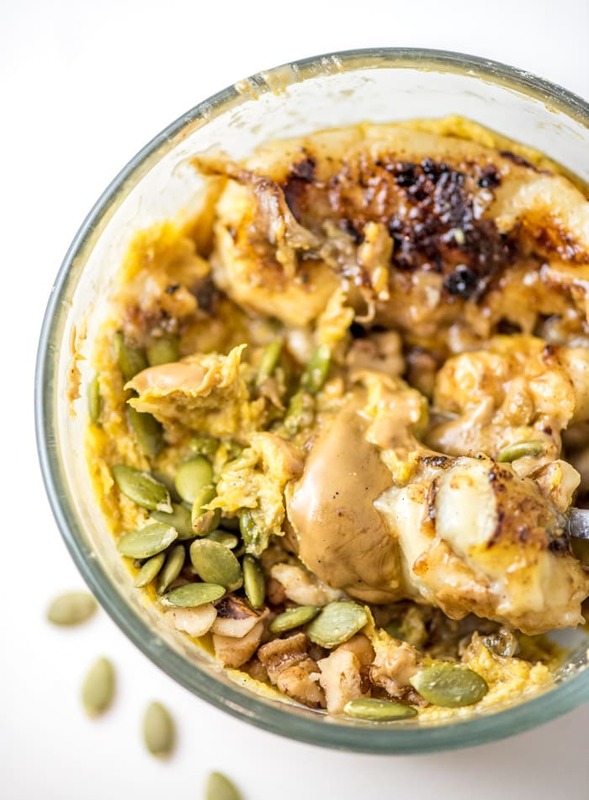 These squash protein pudding breakfast bowls are topped with caramelized banana, walnuts, pumpkin seeds and nut butter for a delicious, healthy and filling start to the day. 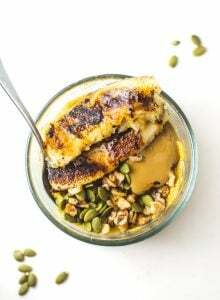 The protein pudding can be made with any cooked squash or even canned pumpkin. I love them with acorn squash but butternut squash and kabocha squash are also good. Canned pumpkin works well too for a pumpkin-twist if you don’t have any squash on hand or don’t feel like cooking. The only squash that isn’t suitable for this recipe is spaghetti squash. To make mashed squash, I cook all squash the same way. I cut them in half, leaving the seeds intact, place them face down on a baking tray and bake at 450 degrees until easily pierced a fork. This should take 30-40 minutes depending on the size of the squash. Once the squash is cooked, you can easily remove the seeds in one swift scoop. Then you can either let them cool and peel them, store them as is or scoop the flesh out and into a container for storing. I usually cook 2-3 squashes as part of my weekly food prep, they can all go on one tray and be baked at the same time. I use mashed squash throughout the week in oatmeal, soups, curries, smoothies and puddings. Mashed squash keeps well in the fridge for up to 5 days or you can freeze it in portions for up to 3 months. 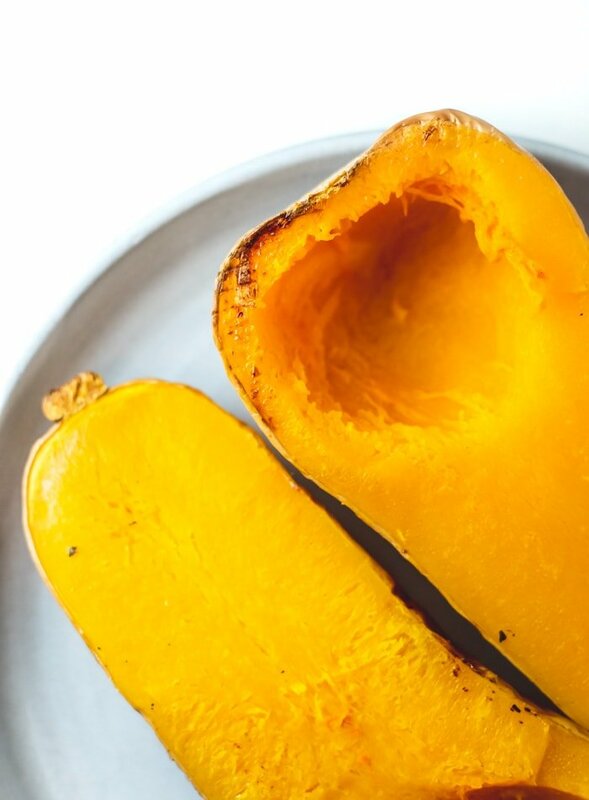 Beautiful orange and yellow squashes are an excellent source of carotenes and have been shown to exert a protective effect against many cancers, in particular lung caner. Diets rich in carotenes also appear to offer protection against developing type 2 diabetes. Winter squash are also rich in vitamin C, folic acid, potassium, fibre, vitamin B6 and niacin. Nuts. Try pecans, walnuts, almonds, cashews or pistachios. Soak them overnight then rinse before storing in the fridge to improve digestibility. Seeds. Seeds are so full of nutrition and usually less expensive than nuts, so I eat them often. Try pumpkin seeds, sunflower seeds, hemp seeds or sesame seeds. I love chia seeds and ground flax too but I prefer adding those to oats and smoothies or making chia seed pudding. Chia seed jam would be good though! Nut and seed butters. A must-have for me. Any nut or seed butter works! I love sunflower seed butter, almond butter and tahini. Peanut butter is also good (I just can’t eat it..so sad). Sautéed apple. Ever since I made cinnamon oats with sautéed apple, I’ve been obsessed with cooking apples this way. You can also do baked apples – just follow the instructions from my baked pears recipe. Warmed fruit. Try heating up peach slices or berries in a small pot stovetop until ooey, gooey and delicious. These make an amazing topping for these bowls. Fresh fruit. Any and all fresh fruit is great! Dairy-free chocolate chips. If you feel like a little treat, add a few dairy-free chocolate chips or chopped dark chocolate. Melting them would be even better. Coconut. Coconut butter, coconut bacon, coconut flakes and shredded coconut are all delicious. Dried fruit. I love goji berries, mulberries, chopped dates, cranberries and raisins. Dairy-free yogurt. Try a little dollop of coconut or cashew yogurt. So many choices! Have some fun with it! Quick caramelized bananas take just minutes to make in a good non-stick skillet. I like to cut a banana in half lengthwise, sprinkle them with a pinch of cinnamon, sea salt and coconut sugar and cook it over medium-high heat for a few minutes per side until golden brown. The sugar is optional, or if using, any sugar works. The sea salt is optional too but I just love the flavour it adds. I give the pan a quick spray with non-stick coconut or avocado oil cooking spray before cooking. To make the protein pudding, simply add well-done, cooked squash to a bowl and mash it up in a bowl with vanilla protein powder. You can leave it just like that or add a little splash of almond milk or spoonful of dairy-free yogurt for a creamier pudding. Once you’ve got your pudding mixed up, add your choice of toppings and enjoy. 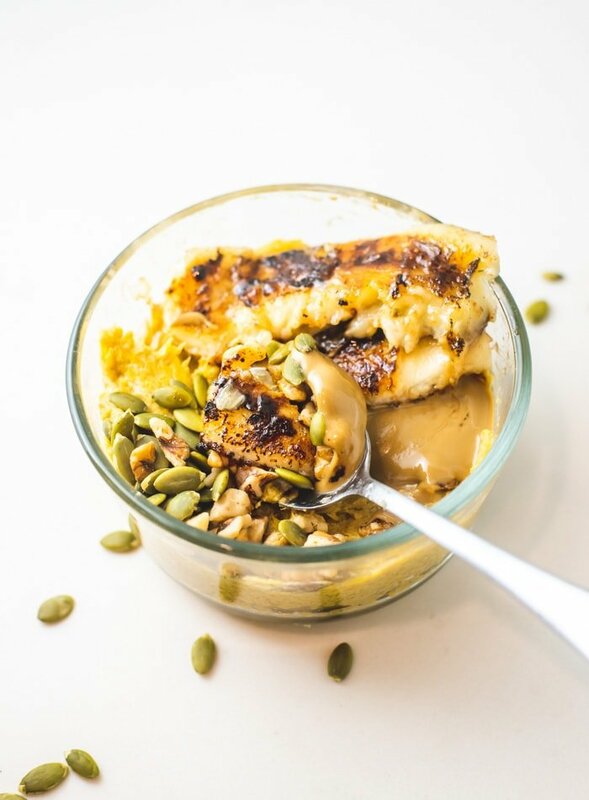 You can also a larger batch of pudding by adding cooked squash to a food processed with 1 scoop of protein per cup of mashed squash, blending until smooth and then storing in the fridge to enjoy throughout the week. Check my post on vegan protein cooking dough for more tips on this. I actually eat just the squash pudding for a snack all the time, which I often make with just canned pumpkin and vanilla protein powder. It’s really good with a little coconut yogourt mixed in and little spoonful of almond butter on top. So many options, all so yummy! 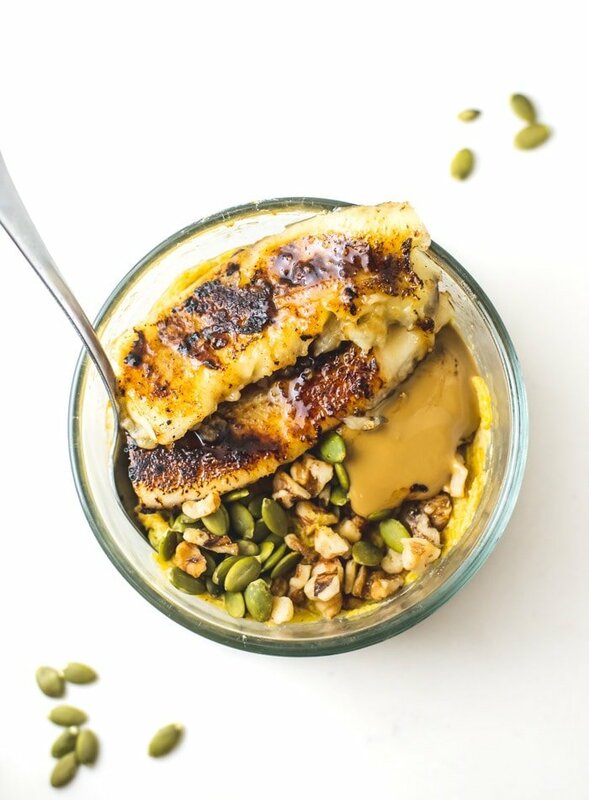 Get fancy by topping these squash breakfast bowls with easy and oh, so delicious caramelized banana. 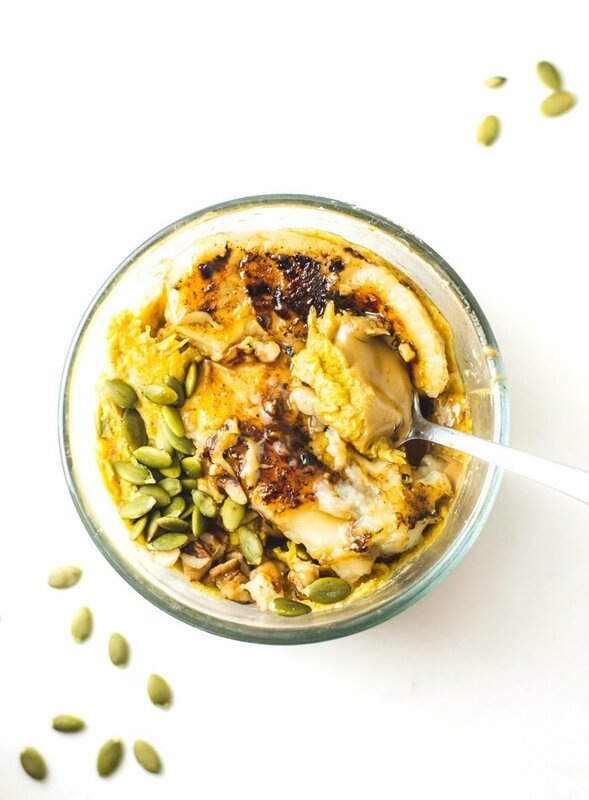 Walnuts, pumpkin seeds and sunflower seed butter adds some healthy fats and with the added protein powder, this makes a well-balanced, yummy, filling vegan breakfast. Try it to re-fuel after a morning workout. To make the pudding, add the cooked squash to a bowl and mash up with the protein powder. You can add a little splash of almond milk or scoop of coconut yogurt if you prefer it to be a little creamier. 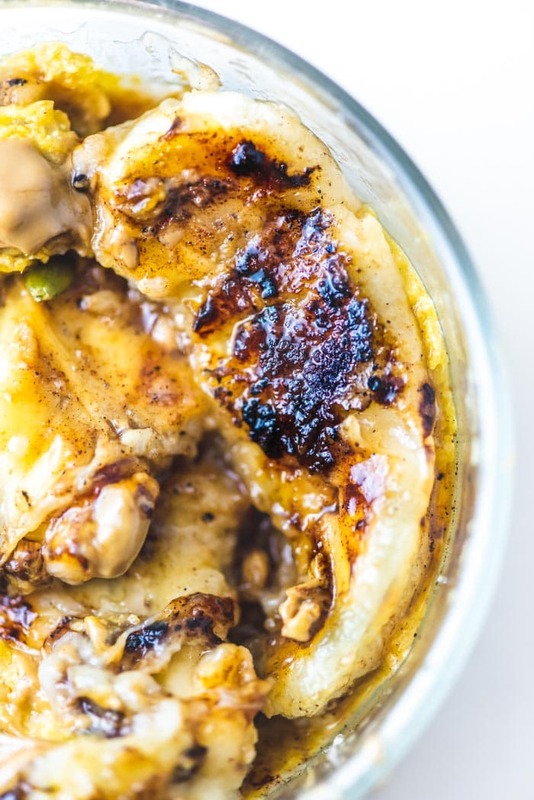 To make the caramelized banana, spray a skillet with a little non-stick avocado or coconut oil cooking spray (or use a very small amount of coconut oil), sprinkle both sides of the sliced banana with a pinch of cinnamon and coconut sugar and cook over medium-high heat until browned on both side. This only takes a minute or two. 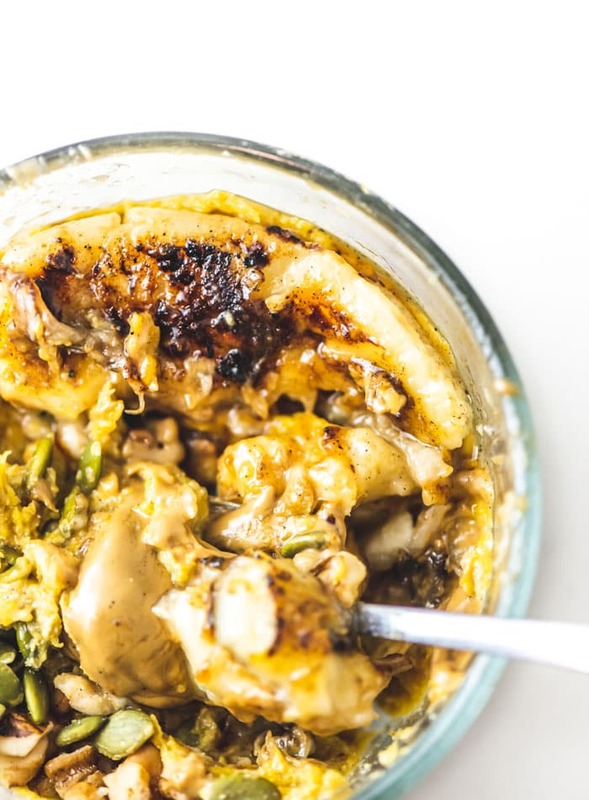 Try not to overcook it or it will be so gooey it falls apart. 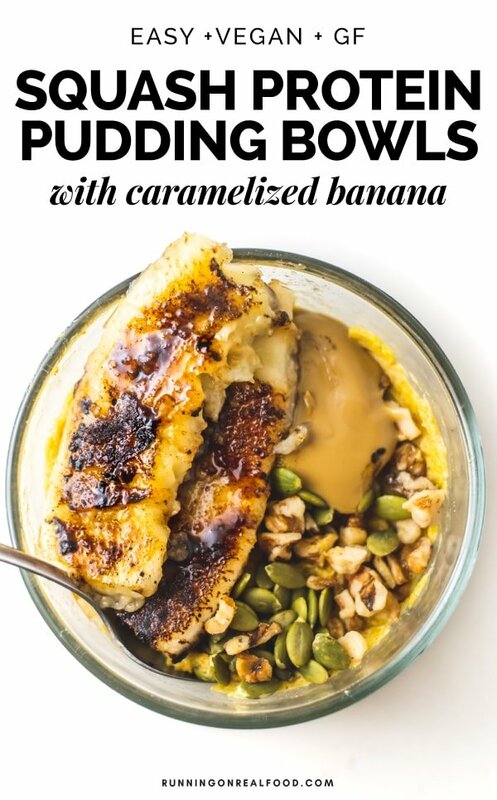 Top your protein pudding with the caramelized banana and any other desired toppings and enjoy. To roast squash, cut in half and place face down on a baking tray. Roast at 450 degrees until easily pierced with a fork, approximately 30-40 minutes. Remove the seeds (you can remove before baking if you prefer), scoop out the cooked squash and enjoy. I absolutely love this recipe. I travel every other week for work and this is a great breakfast that I can make in my room or at the office. I usually buy frozen organic squash cubed and microwave in some almond milk. I then mix it with my vegan pea protein and add some flax, chia and cinnamon… absolutely filling and delicious. Plus speedy which makes it easy while on the road. Yes! Isn’t it the best! It’s one of my go-to recipes too. Well, barely a recipe…breakfast idea I guess you call it! Glad you’ve been enjoying it!